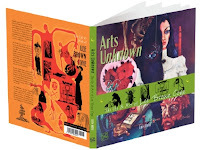 Luis Ortiz has been doing an important series of biographical art books, beginning with Arts Unknown: The Life & Art of Lee Brown Coye (Nonstop Press, 2005). With 350+ illustrations, this is the first full survey of the phantasmagraphical eccentric Coye (1907-1981), a muralist and watercolor artist who exhibited at both the Whitney and the Metropolitan Museum of Art in addition to his outré illustrations for Weird Tales. For models Coye brought into his studio skeletons, dead animals, live rats, and human body parts from a medical college. Ortiz writes, "Coye was an art machine and an American Original. As a child he was considered a 'holy terror'. As an adult, after a hard day of doing medical illustrations, he thought nothing of walking into a bar carrying a decapitated human head under his arm, placing it on the counter and buying his guillotined 'friend' a drink. On another occasion he 'borrowed' the finger-bone of a saint (a holy relic he was building a reliquary for) from the Catholic Church in his hometown of Syracuse, New York. The Syracuse diocese was beside itself and had to send clergy to perform a blessing on Coye's studio since the relic could only travel to holy places." When Coye was young he was in upstate New York and found an oddity while wandering in the backwoods near an isolated, abandoned farmhouse. Surrounding the house were strange arrangements of crossed sticks. Coye never forgot this and later drew arrangements of sticks into his illustrations, suggesting something sinister. 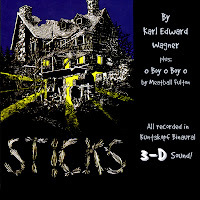 The horror writer Karl Edward Wagner used the incident as the basis for his award-winning short story, "Sticks", with twigs grouped in lattice-like patterns. Adapted by Tom Lopez into a memorable, chilling ZBS audio production, aired in 1984 on The Cabinet of Dr. Fritz, Wagner's story was an apparent source for The Blair Witch Project (1999). As a promotional device for that film, Manhattan's Angelika and other movie theaters put sticks into lobby display cases. 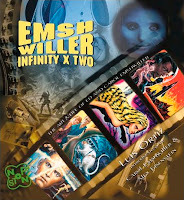 Nonstop followed the Coye collection with a biography of author Carol Emshwiller and illustrator-filmmaker Ed Emshwiller, along with previously unpublished art, in Emshwiller: Infinity X Two: The Art & Life of Ed and Carol Emshwiller (2007), also from Nonstop. These are the first two volumes in the publisher's Library of American Artists. During the 1950s and 1960s, Ed Emshwiller was both an abstract gallery painter and a Hugo Award-winning illustrator for science fiction magazines and paperbacks (using the signature Emsh and sometimes Emsler). In the early 1960s he moved into filmmaking, serving as a cameraman on several features (Hallelujah the Hills, Time of the Heathen) and documentaries (The Streets of Greenwood) while also creating his own experimental films/video and pioneering the new tools of computer animation. CalArts is the school founded by Walt Disney, and in 1979, Emshwiller became dean of the School of Film/Video at CalArts where he founded the school’s Computer Animation Lab in 1983. I first became aware of Emshwiller in the early 1950s with his illustrations for Galaxy Science Fiction, notably his clever June 1952 cover depicting a futuristic energy crisis as described in Frederik Pohl and C.M. 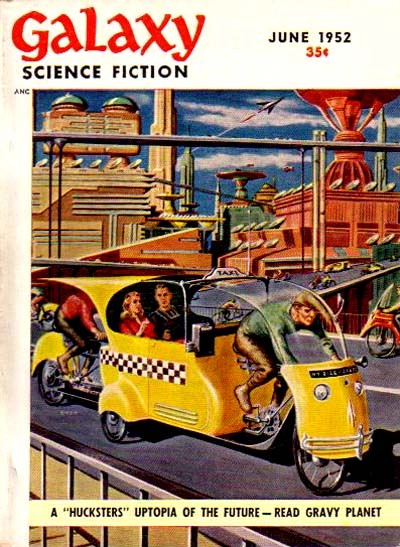 Kornbluth's The Space Merchants (then called Gravy Planet). In addition to more than 700 sf covers, he also did a great number of black-and-white interior illustrations, including some which were masterful in their storytelling and dramatic tension. 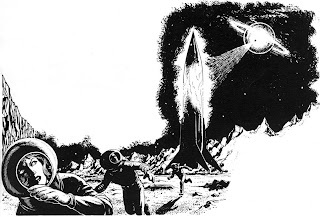 (The one above illustrates "The Dark Side of the Moon" by Sam Merwin, Jr. from the June 1953 issue of Space Stories. Click to enlarge and see details in the inking.) Oddly, no more than two or three of his superior b/w illustrations bob to the surface of the entire Internet. I met Emshwiller in 1961 when I was booking short films into the Charles Theater on the Lower East Side. We screened his Dance Chromatic (1959) which combined abstract paintings with the movements of a dancer. He explained how this was all accomplished in the camera; he would rewind to get the double exposure. So there was an element of guesswork involved, yet the finished result appeared to have been carefully planned. At a New York Film Festival press screening a few years later, I was taken aback when he mentioned that my own film, The Year the Universe Lost the Pennant (1961), had been an influence on his stunning Relativity (1966), a film he noted as "something that deals with subjective reality, the emotional sense of what one's perception of the total environment is -- sexual, physical, social, time, space, life, death." Forthcoming from Nonstop are the Sketchbook of Fantasy & Science Fiction Art (Fall 2008), Earl Kemp's Encyclopedia of Cult Magazines: A Compendium of Culturally Obsessive and Curiously Expressive Publications (2008) and Comic Brut (2009) which includes Otto Soglow (The Little King), Carl Anderson (Henry), Irving Phillips (The Strange World of Mr. Mum), Antonio Prohias (Spy vs. Spy), Jim Woodring (Frank), Frans Masereel and Lynd Ward, Marjorie Henderson Buell (Little Lulu), Harry Hanan (Louie), Mik (Ferd'nand) and Ernie Bushmiller (Nancy). 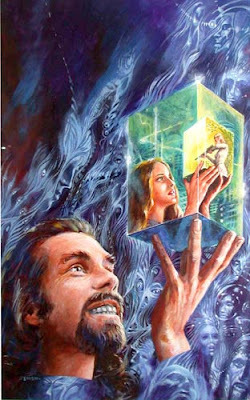 Above is Emshwiller's portrait of Robert Silverberg. I didn't know that you were connected to the Charles Theatre, and knew Emsh at the time. There are many people that I missed talking to when I was working on INFINITY X TWO. Feel free to contact me through my publisher’s website www.nonstop-press.com. 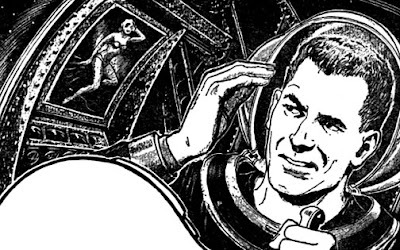 In an interview with The Comics Journal, Bill Griffith mentioned that Ed Emshwiller was his childhood neighbour, and that he and members of his family were occasionally used as models for his sci-fi illustrations.